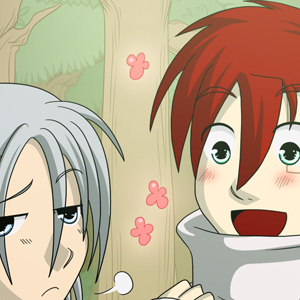 By the by, strip number 8 was redrawn and uploaded at around 3:00am today, haha. XD You can check that out below! Thanks so much for your support <3 see you on Friday! Heh. I love how these two know they can't just go at it weapons and magic swinging. They're actually strategizing. Gah, really, Rufi??? at 03:00??? Well, go to bed then and sleeep!!! Ah, more fighting before the talking. I'm really happy you like Sayo, D! :D <3 I look forward to how he'll turn out! Panel 3 is now proof of Madou's true alignment. Surely only the most despicable of criminals would litter so casually! And indeed, Madou reveals his villainous ways! What he SHOULD do is collect the glass shards and make traps out of them later to trap tiny animals. Jeeez! You definitely deserve a break, Rufi!! Take one and recharge! He's so cool about it though eeee. So full of swag and stuff. I can't decide if his old robes are cooler than the "Renault" ones or not 'cause damn. Awww, thankyew seamuffin :D <3 I'll be taking one on the 23rd for sure! MADOU LITTERED! Madou is littering, that's the worst crime ever. That's even worse than something like jaywalking. Either way, it's interesting because both of them know what's up(at least to some degree). Madou's hair looks more fabulous here too o_O...for some reason. XD; Yayyy! Ah, bad Madou, be a good citizen and at least use a rubbish bin, okay? And Madou's hair looks fabulous what? XDDD Well I admit I have fun drawing it all the time (it's kind of like a bird's nest lol) so I'm happy to hear that! Thank you Spelluuuu <3 *hug hug hug* I shall! Truly the most evil of all the villains!! I bet he doesn't put books back in the library into their proper shelves, either. And I bet he doesn't rewind DVDs before returning them to Blockbusters! No shame in taking a break if you overworked yourself a little. And Madou in panel three reminds me a little of Hisoka of Hunter X Hunter fame. It's probably the spades and heart in his speech bubbles. Though the nonchalantless with which he treats the fight adds to that feeling, obviously. As for bottles: I only ever got about half my potion bottles back at larps. So I started to charge a depot on them and hand out said depot even for other potion bottles brought back to me, as long as they were with lid or cork and in good shape. Remember to recycle your potion bottles too, Lukkai! Oh, I'm constantly reusing my potion bottles. A proper wash and they're good to go again. By the way: You think you've seen my worst puns? Probably didn't read the last I wrote in last comics comment section yet! What is our dear assassin's favourite pastime? Well, going Sho'pping of course! I think I'm still learning how to make an expanse look like an expanse a not as claustrophobic as I ended up with here, but it does seem to work to an extent given what's happening, so I'll go with it for now. XD; Yay for blue eerie light regardless! Ohhh... this page is so blueeee .^__^. Makes my heart sing! But I'm worried what will be the outcome of this :i Be friends guys? Uh oh. Summoning magic up his sleeve? At point the bottle tinks up against the barrier, dispelling it instantly as it was a force that came from Inside the bubble and popped it. Also, does that barrier extend underground? Ice generation as death from below may actually work. It does extend there to a degree, yep. :) That, and Kylie can't use her Lethiace anyway. XD; But she knows the light barrier spell has a time limit so she just has to wait it out! >_< Yep, Proxy... she may not like being patient, but she's seasoned enough to know waiting is worth it rather than wasting energy. Ugh, I so hate turn based RPGs! Will someone's bar just fill up so someone can DIE?!!!! Also Rufi..giiirl you are totally entitled to take breaks whenever u need! Heck even if ya had to go to 2 a week, it would be understandable and poopie on anyone who says otherwise XD. (I can't manage more than one but I suppose "ones" are greater than or equal to two XD). Can't wait for the next page thoo! Aaah what's gonna happen to Kyliiie! Hey, Rufi! Out of habit does not do it! Cut back to two updates or one if you need to! Aww Mjkj, no worries. :) There's a motto my gym says, which is "Motivation is what gets you started. Habit is what keeps you going." I think it's very true! Discipline means I do it even if I don't 100% feel like it. Otherwise, I wouldn't be able to be a professional. That said, I do extremely appreciate your grace and patience was a reader, as well as your support, and I thank you very muchly for it. *hug* :) Thank you! !